Wadi Al-Hitan, (Arabic: وادي الحيتان‎, "Whale Valley") is a paleontological site in the Faiyum Governorate of Egypt, some 150 km southwest of Cairo. It was designated a UNESCO World Heritage Site in July 2005 for its hundreds of fossils of some of the earliest forms of whale, the archaeoceti (a now extinct sub-order of whales). The site reveals evidence for the explanation of one of the greatest mysteries of the evolution of whales: the emergence of the whale as an ocean-going mammal from a previous life as a land-based animal. No other place in the world yields the number, concentration and quality of such fossils, as is their accessibility and setting in an attractive and protected landscape. This is why it was added by the UNESCO to the list of protected World Heritage sites. The fossils found at the site may not be the oldest but their great concentration in the area and the degree of their preservation is to the extent that even some stomach contents are intact. 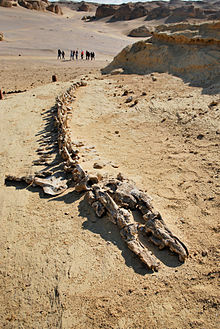 The presence of fossils of other early animals such as sharks, crocodiles, sawfish, turtles and rays found at Wadi El-Hitan makes it possible to reconstruct the surrounding environmental and ecological conditions of the time, adding to its justification to be cited as a Heritage site. The first fossil skeletons of whales were discovered in the winter of 1902-3. For the next 80 years they attracted relatively little interest, largely due to the difficulty of reaching the area. In the 1980s interest in the site resumed as four wheel drive vehicles became more readily available. Continuing interest coincided with the site being visited by fossil collectors, and many bones were removed, prompting calls for the site to be conserved. The remains display the typical streamlined body form of modern whales, yet retaining some of the primitive aspects of skull and tooth structure. The largest skeleton found reached up to 21 m in length, with well-developed five-fingered flippers on the forelimbs and the unexpected presence of hind legs, feet, and toes, not known previously in any archaeoceti. Their form was serpentine and they were carnivorous. A few of these skeletal remains are exposed but most are shallowly buried in sediments, slowly uncovered by erosion. Wadi El-Hitan provides evidences of millions of years of coastal marine life. Fossil reptiles are represented by fossils of crocodiles and sea turtles, and bones of sea snakes have also been recorded. There are many species of bony fish, sharks and rays represented, but most of the fossils are isolated small teeth and these are not often conspicuous. Larger fish fossils include the rostra and pegs of sawfish; a sawfish rostrum of 1.8 metres long is laid out in the park. Fossil shells are not common in the main whale-bearing rocks, but are very common in other rocks; many fallen rocks can be seen to be full of a wide variety of fossil shells. Disc-shaped nummulite fossils are common in places, and often coat the desert floor. A large log is present in the park, and this is full of tubular shipworm fossils. Some fossil seagrasses are also known. The geology of the valley gives rise to the scenery, with wind and water erosion producing spectacular cliffs and buttes. The rocks present at Wadi El Hitan are all Middle to Late Eocene in age and comprise three main rock units. The Gehannam Formation comprises open marine mudstones, which are largely present on the flatter ground to the East of the public park. The rock unit that contains most of the whale fossils is the Birket Qarun Formation. This comprises yellowish open marine sandstones that form most of the cliffs and buttes. The monotony of these sandstones is broken by a white layer full of well-preserved animal burrows (previously thought to be mangrove roots) and a layer of black mudstone above that. When the cliffs of the Birket Qarun Formation are followed to the East, they are replaced by Gehannam Formation mudstones, indicating a change in water depth from shallower to deeper in that direction. The tops of the higher cliffs are within the Qasr el Sagha Formation, which comprises dark mudstones alternating with limestones full of shells and represents a lagoonal environment. Wadi El Hitan, is also home to 15 species of desert plants, sand dunes and about 15 types of wild mammals including the North African jackal, red fox, Egyptian mongoose, African wildcat, and dorcas gazelle. Fennec foxes are the most commonly seen mammal and regularly visit the camp site at night. Also, attracted by the lakes at Wadi El Rayan are recorded 19 species of reptiles and 36 species of breeding birds. Only about 1000 visitors a year drive into Wadi El Hitan by 4WD because the track is unpaved and crosses unmarked desert sands. For the most part, visitors to Wadi El Hitan are foreigners, who usually camp in the valley on winter weekends. Because Wadi el-Hitan is within the Wadi El Rayan Protected Area, the same protection management plan restricts visitors to prearranged guided tours along a prescribed trail. Sustainable tourism is beginning to develop and grow in the area, and the 4WD are alternatively being replaced by foot or camel treks. Since part of Wadi el-Hitan was made into a tourist venue, walkways between the main fossils were laid out and small shelters built. This public park is now regularly visited by tourist groups, and a small camp site is present. The valley is located behind a mountain known as Garet Gohannam "the Mountain of Hell". In the light of the setting sun, the mountain seems ablaze with an eerie red light. 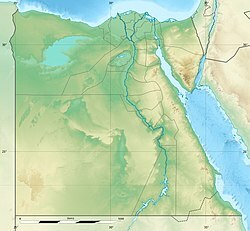 The Egyptian government has alleged that in July 2007 a pair of cars driven by Belgian diplomats entered a protected zone in this area, and caused 10 million US dollars worth of damage. The Belgium government has said no damage was caused by its diplomats. The issue remains unresolved. ^ "Wadi Al-Hitan (Whale Valley)". UNESCO. Retrieved 20 July 2006. ^ "Africa World Heritage sites named". BBC News. 15 July 2005. ^ "Blundering diplomats destroy $US10m whale fossil". AFP. Retrieved 27 August 2007. Wikimedia Commons has media related to Wadi El-Hitan. "Wadi Al-Hitan trek on Google Earth". Ogle Earth. 13 May 2007. "Images from a trek to Wadi Al-Hitan on Flickr". Stefan Geens. 13 May 2007. This page was last edited on 31 January 2019, at 16:58 (UTC).